The writers’ strike is over and the Oscars will be presented in all their glitzy red carpet glory this Sunday (ABC, 8 p.m.). Producer Gil Cates (the Jewish uncle of interfaith actress Phoebe Cates) is undoubtedly relieved that Oscars host Jon Stewart (Jewish, too) doesn’t have to write his jokes all by himself. 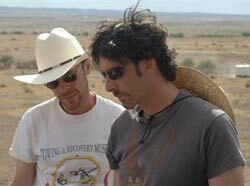 Three nominations for best director were given to Jewish directors: Joel and Ethan Coen (No Country for Old Men), Jason Reitman (Juno) and Julian Schnabel (The Diving Bell and the Butterfly). The Coen brothers are also nominated for best adapted screenplay and No Country picked up a grand total of eight Oscar nominations. Joel, 53, has been married to actress Frances McDormand, 50, since 1984 and they have one son, a child they adopted from Paraguay. McDormand has appeared in several of the Coen brothers’ films and won a best supporting actress Oscar in 1996 for her performance in her husband’s film, Fargo. McDormand is the daughter of a Protestant minister and her sister is also a minister. Ethan, 50, is married to Tricia Cooke, a film editor who mostly works on her husband’s movies. I don’t know anything about her personal background. The Coens have had a few Jewish characters in their past movies. My favorite has to be Walter Sobchak in The Big Lebowski. Sobchak is a working class Vietnam veteran and a Polish Catholic who converted to Judaism when he married a Jewish woman. Despite being divorced five years, he is still devoted to his Jewish ex-wife and remains a Sabbath observant Jew. Exuberantly played by John Goodman (who isn’t Jewish), Walter is a delightfully off-the-wall character who gives some amusing and insightful speeches about being Jewish. The Coens will soon be entering the “most Jewish” phase of their film career. In April, they will start filming A Serious Man, which is set in the ’60s and centers on a Jewish college professor in Minnesota who is going through a midlife crisis and seeks answers from a succession of rabbis. Location shooting will probably include the Minnesota synagogue where the brothers went to Hebrew school. After Serious Man, the Coens will start making The Yiddish Policemen’s Union, from the novel by Jewish writer Michael Chabon. It is an alternative history novel, imagining a world where the Jews of Eastern Europe were able to escape the Nazis but had to settle in a Jewish refuge in Alaska. I suspect that the Coens may just open up about the own current religious practice in the publicity run-ups just before these two films open. 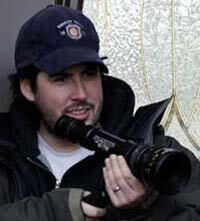 Jason Reitman, son of director/producer Ivan Reitman, was nominated for best director for only his second film, Juno. Jason’s mother is likely a convert to Judaism. Photo courtesy Fox Searchlight Pictures. Jason Reitman, 30, is sitting on top of the world right now. Juno, his second movie (the first was the critically acclaimed Thank You for Smoking), was supposed to be a modest indie comedy/drama about a teen pregnancy. Costing $7.5 million, it has made more than $100 million already. Reitman recognized that first-time screenwriter Diablo Cody (who got her own Oscar nomination) had written a great script and worked closely with her during the whole production. He calmly coaxed terrific performances out of a very good cast that included relative newcomer Ellen Page (another Oscar nominee) in the title role. Jason is the son of famous film director/producer Ivan Reitman. Ivan’s credits include Ghostbusters and Kindergarten Cop. Ivan Reitman’s Czech Jewish parents barely survived the Holocaust. After the war Ivan’s parents–cradling Ivan in their arms–evaded Czech Communist border guards and fled to Austria. The family eventually settled in Canada. Ivan moved to Los Angeles for his career and he and his wife (Jason’s mother) have long been members of a Los Angeles Conservative synagogue. My strong suspicion, based on Jason’s mother’s birth name, is that she is a convert to Judaism. Jason recently recalled that when he was 12, his father told him he didn’t like to attend the Oscars but would go if he were nominated. Jason asked Ivan, “Would you go if I was nominated?” Ivan said that he would go if Jason was nominated and his (very proud) father will be at this year’s Oscar ceremony. Julian Schnabel, 56, is a world famous painter who has also directed three films. The Diving Bell and the Butterfly is based on the true story of a French journalist who had a stroke that left him incapable of communicating except by blinking one eyelid. He managed, however, to write his memoir while in this condition. Schnabel insisted on making the film in French and the lead character is played by the very good French actor Mathieu Amalric, 32, who is best known in America for playing a shadowy arms dealer in Steven Spielberg‘s Munich. Sources are a bit sparse, but it is clear that Mathieu’s mother is Jewish and it seems like his father is not. Schnabel recently told the London Jewish Chronicle that he decided to make Diving Bell because his father’s recent terminal illness made him confront the issue of mortality. (His father was a Czech Jewish immigrant who died at 92). Schnabel added that while he had a bar mitzvah, he was not very religious–but was he very concerned about moral issues. His next film will be about the persecution of a gay Cuban artist by the Castro regime. Schnabel has been married twice and has five children. I am quite sure that neither of his wives is Jewish. Tamara Jenkins, nominated for her screenplay for The Savages, is the daughter of a Jewish car salesman and a Catholic former hat-check girl. She considers herself a “half-breed.” Photo courtesy Fox Searchlight Pictures. 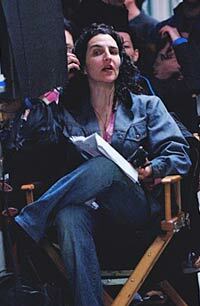 Tamara Jenkins, 45, is nominated for best original screenplay for The Savages, which she also directed. The Savages is a critically acclaimed drama (with much humor) about a dysfunctional brother (Philip Seymour Hoffman) and sister (Laura Linney, who snared a Best Actress nomination for her performance) who are forced to assume care for their aging and ailing father (Philip Bosco). Jenkins is married to Jim Taylor, the Oscar-winning co-author of Sideways. If you saw the 1998 cult comedy hit, Slums of Beverly Hills, which was also directed and written by Jenkins, you already know something about her family. I’m a half-breed. I’m Italian on my mother’s side and Jewish on my father’s side. You know, a mutt. I wasn’t bat mitzvahed or anything. My family was very fractured, all over the place, and there were Christmas trees and Chanukah celebrations all mixed in together. There was like Catholic Church and synagogues, randomly, depending on the weather. So it wasn’t ever a consistent thing. But there was a lot of good food on both sides. Her parents split up when she was a young teen and her father got custody. They moved to Los Angeles and, from there, her life story largely mirrors Slums of Beverly Hills. She and her brother lived with their financially challenged father in a series of the cheapest apartments in Beverly Hills so they could enroll in Beverly Hills schools. Sadly–and this is not in the movie–eventually her father couldn’t provide for her, and her older brother became her guardian. After Slums, Jenkins says, people sent her scripts, but there was nothing she was interested in directing; she says she doesn’t work well as a gun-for-hire. The Jewish songwriting team of Alan Menken (Beauty and the Beast) and Stephen Schwartz (“Pippin”) earned three of the five Oscar nominations for best song (for three tunes they wrote for the Disney film Enchanted). Menken, 57, is among the most honored composers of our time, having won eight Oscars since 1989 for best score or best song. He composed his first show as a teenager, working with his mother to write a musical for their New York synagogue based on Jewish immigrant letters to Forverts, the Yiddish precursor to the Forward. Menken is still a synagogue member. Beaufort, an Israeli film about the first Lebanon War, snared an Oscar nomination for best foreign film. It competes with The Counterfeiters, an Austrian film, based on an actual historical event, about a group of Jewish prisoners who were forced to produce phony currency for the Nazis. Some have labeled Daniel Day-Lewis, who is a heavy favorite to win best actor for his performance in There Will Be Blood, a “Jewish actor.” While his mother is Jewish, it’s unlikely Day-Lewis sees himself as such–although he is married to Jewish playwright Arthur Miller’s daughter. Photo © 2007 by PARAMOUNT VANTAGE, a Division of PARAMOUNT PICTURES and MIRAMAX FILM CORP. All Rights Reserved. The only actor or actress with a Jewish parent nominated this year is Daniel Day-Lewis, 50, who is a heavy favorite to win the Best Actor Oscar for There Will Be Blood. I left Day-Lewis for last because I feel like a spoilsport at a party when I tell my readers about Day-Lewis’ detailed background. After all, sources like the JTA, when they wrote about this year’s Jewish Oscar nominees, simply noted that Day-Lewis’ mother, English actress Jill Balcon, now 83, is Jewish. Personally, I would not define the Protestant-raised Day-Lewis as a “Jewish actor.” He’s a bit reclusive, so knowing what he thinks is a bit tough–but there are clues in the public record. Cecil Day-Lewis, Daniel’s father, had quite a reputation as a womanizer when he married Jill Balcon in 1951 in a registry office. He was 47 and she only 26. Jill’s father, Sir Michael Balcon, one of the most famous producers in British film history, and a highly assimilated Jew, opposed the match because of Day-Lewis’ reputation. His opposition did not soften before Cecil’s death in 1972. Cecil Day-Lewis was born in Ireland, the son of an Anglican minister. Cecil spent most of his life in England, attending Oxford University and then building a reputation as a poet that culminated in him being named Poet Laureate of England in 1968. After a flirtation with communism in the ’30s, Cecil remained a political progressive, but returned to more traditional values. Daniel Day-Lewis was baptized into the Anglican Church and the young Daniel sang in the hoir at his London church. Even though he often saw his Jewish grandfather, Daniel says that he never heard a word of Hebrew or Yiddish until he was past 18. Being good liberals Daniel’s parents first sent him to a government-run schools with working class kids. In a 1994 interview with TIME magazine, Daniel spoke about being picked on by his working class schoolmates. A quote from the interview, below, has been “transformed” into a notation in many on-line biographies of Day-Lewis that he suffered from antisemitic bullying. These sources repeat each other without really looking into what Day-Lewis said. The question is: how would these working class kids know that Daniel was Irish or Jewish? They certainly would not know these things based on Daniel’s accent, his religious practice, or his last name. His parents were not so famous that working class kids would know that his father was Irish-born and his mother was Jewish. These kids knew Daniel was well-to-do from his accent and, so, he changed his accent. It is more likely he was picked on because he was “posh”–not because he was from a religious or ethnic minority. When Daniel was 12, his parents sent him to a fancy, progressive private school. A British Protestant writer went to this school at the same time as Day-Lewis. In an essay on British antisemitism, he recalled a number of secular Jews at the school, but said that the student body was led by the “golden ones of the school’s Gentile Establishment.” He included Daniel Day-Lewis in this group. He didn’t know when he was in school that Daniel’s mother was Jewish and still didn’t know that when he wrote his essay. I don’t believe the working class boys of London knew either. While Daniel Day-Lewis had what might be called less than pleasant aspects of his childhood, this whole tale of childhood bullying (with a hint of possible antisemitism) seems an attempt by a TIME magazine writer–clearly abetted by Day-Lewis himself–to give Day-Lewis’ life the drama of struggle. The doors of the acting profession were open to him and he was well-equipped to take advantage of this opportunity. For the most part, his acting career has been one triumph after another. He chooses to work very sporadically and his body of serious film work is only 15 films. Nonetheless, he has won one best actor Oscar (“My Left Foot”) and been nominated three other times, including his latest nomination. No question, Day-Lewis is a great actor. In his personal life, consciously or unconsciously, he shifts his identity to always be viewed perfectly in accord with the tenor of British/European Left fashion. He has the timing of a great actor. Let me explain. As he says himself, when being a working class English lad was required, he put on a working class accent. Sent to a posh liberal school, he emerged as a golden boy of this school, a spot that the secular Jews at the school didn’t quite find themselves occupying. Yes, his father was Irish, but it was Irish with a big asterisk. Only one of Cecil Day-Lewis’ grandparents was born in Ireland and Cecil’s own father was born in England. Plus he was a Protestant minister in Ireland–hardly part of the historically oppressed Irish Catholic masses. As a matter-of-fact, the Irish Catholics bitterly resented that they were forced to pay for the upkeep of the Anglican Church in Ireland until the late 19th century. There were some prominent Protestant Irishmen who supported the mostly Irish Catholic struggle for independence from Britain. The Day-Lewis family was not among them. In 1940, Ireland declared itself a republic, and Cecil Day-Lewis, because he was born in Ireland, had the option to take Irish citizenship. Instead, he opted for British citizenship due to Britain’s opposition to the Nazis and Ireland’s neutrality. At the time he was working for the BBC. The Irish Republic lost a lot of its fashionable sheen among the Left during World War II. A nationalist government installed the Catholic Church as the state religion, kept Jewish refugees out of the country and refused to declare war on Germany. When Hitler committed suicide in 1945, the president of Ireland made a condolence call on the German embassy in Dublin. But the Irish struggles came back into favor among the Left in the 1970s with the movement to end anti-Catholic discrimination in the six Northern provinces of Ireland that Britain retained. The heavy-handed tactics of the British government in suppressing the IRA made many on the Left willing to overlook the IRA’s often brutal tactics and killing of innocents. Enter Daniel Day-Lewis in 1993 with In the Name of the Father, a movie based on a true story of Irish Catholic immigrants in Britain falsely accused of complicity in IRA bombings. He earned a best actor nomination for his lead role in this film. Arthur Miller, a secular Jew, was an icon of the international literary Left for many reasons. He was even more popular in literary Left circles in Britain than in the United States. Unlike some Jewish leftists, he never forgot the struggles of his own people and his works dealt with Nazi oppression and he was a strong supporter of Soviet Jewry. He criticized Israel but didn’t demonize it. Day-Lewis and Rebecca Miller were married in a Protestant church in New Haven, Conn., the ceremony presided over by the famous Reverend William Sloane Coffin, a great friend of Arthur Miller. Coffin was the official chaplain of Yale and a prominent figure of the American Left since denouncing the Vietnam War back in the ’60s. In 2005, the Sunday Times of London asked celebrities if they wanted to go to any war zone where “Doctors without Borders” psychologists were working. Day-Lewis decided to go to Gaza. His account of his trip fit neatly into the unbalanced diatribes against Israel that are a staple of European Left journalism. He arrived just at the time that the Israelis had launched a major ground offensive against Gaza following the killing of two toddlers in Israel proper by a Palestinian rocket fired from Gaza. Day-Lewis mentions this incident almost in passing, but his article completely neglects to mention that Israel had already announced that it was withdrawing all its settlers from Gaza starting a few months after the offensive. The point of the offensive was retribution, yes–but also to convince the Gazans that the withdrawal didn’t mean Israel would not defend itself in the future. Day-Lewis’ account is one of oppression without almost any justification and stone-throwing children versus cynical soldiers. This isn’t the forum to go through the entire history of offenses on both sides in the Arab-Israeli conflict. But, clearly, there are those who attempt to bring a balanced and nuanced view to the conflict and those who simply say the Palestinians are the oppressed party and nuance be damned. Day-Lewis falls into the latter category. I wonder what would have happened if Daniel Day-Lewis had emerged as a celebrity actor in the late ’50s and early ’60s? Then Israel was seen as “David” in a David and Goliath struggle with the Arabs. Also, at that time, Jews still lead the Left “hit parade” of the world’s oppressed with memories of the Holocaust still fresh. Well, I suppose back then Daniel might have emphasized his “Jewish side” more. I wasn’t surprised when I read that Day-Lewis’ favorite musician was Bob Dylan. As the recent Dylan biopic, I’m Not There, showed, Dylan is a master changeling. 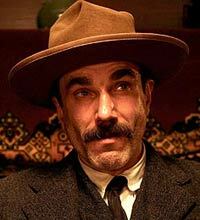 So is Daniel Day-Lewis.